Home / Opinion / Filipino Diplomat: "Yellows like lunatics now shrieking: ‘The end is near’"
Filipino Diplomat: "Yellows like lunatics now shrieking: ‘The end is near’"
Rigoberto Tiglao, a Filipino diplomat and writer, on Wednesday, September 12, 2018, contradicted the opposition's claim regarding the allegedly inflation spike. News about price hikes of basic commodities are everywhere, and of course, the oppositions and the 'Yellows' are blaming the government for the purportedly worsening of commodity prices. Most of them 'Yellows' are now very active on their unrelenting tirades against the present administration and are coming out screaming that 'the end is near' due to the said high inflation. This is the main reason why in his recent article on one of the top news media outfits and newspapers in the Philippines, Tiglao reprimanded the 'resistance' and said that they are absurd on actually thinking that they can overthrow President Duterte just because of this inflation issue and the recent controversy about Senator Antonio Trillanes IV. He then mentioned some personalities that are making public opinions and claiming that the Duterte administration was presently in "economic and political chaos" that denotes the end of one's reigns, thus, saying that 'the end is near' when the economy is in a free fall where costs of items are hitting up, past the scope of poor people. Tiglao thereupon stressed the the 'Yellows' are using this “the-end-is-near” line to discredit the present government and added that it is actually their trademark to have exceptionally restricted manner on using worn out clichés as this recent. "It’s a characteristic mark of the Yellows to have very limited phraseology (or erudition) that they use only tired clichés as this recent “The end is near,” “Never Again” (the Jewish cry against the Holocaust), and of course “Daang Matuwid“(“Straight Path,” a reference to Islam). ", he wrote. Likewise, the veteran writer explained novel factors that said to pushed up the rate in August, hence, will clarify the low swelling rates around this time. 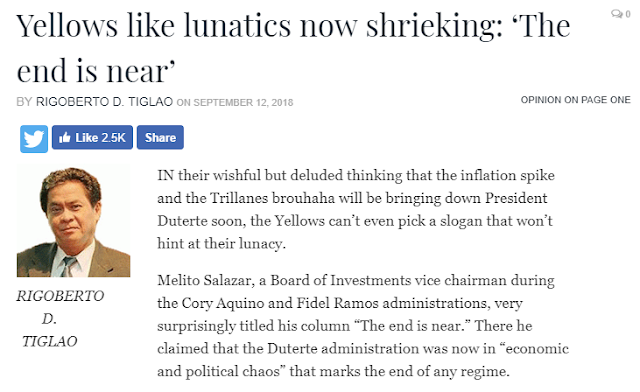 "Yellows like lunatics now shrieking: ‘The end is near’"
"IN their wishful but deluded thinking that the inflation spike and the Trillanes brouhaha will be bringing down President Duterte soon, the Yellows can’t even pick a slogan that won’t hint at their lunacy. 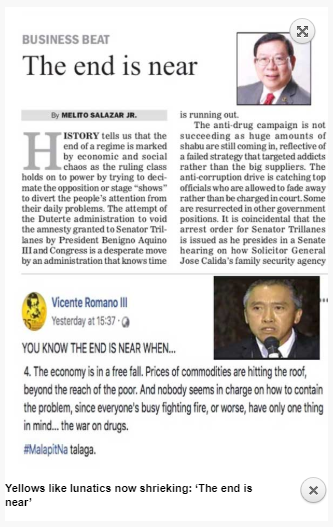 Melito Salazar, a Board of Investments vice chairman during the Cory Aquino and Fidel Ramos administrations, very surprisingly titled his column “The end is near.” There he claimed that the Duterte administration was now in “economic and political chaos” that marks the end of any regime. That “the-end-is-near” line of course is an old, old line used in so many caricatures of religious nuts wearing sack cloth shouting (with placards even): “Repent, the end is near.” So, it is befitting that these Yellows should be using this cliché. Inflation is indeed high at 6.4 percent year on year in August. That means prices went up 6.4 percent from August 2017 to August 2018, not as some Yellows are stupidly claiming, that prices went up from July 2018 to August 2018. That means your P100 in August last year can buy only P94 worth of goods in August 2018. Take it from a business and economic journalist these past many years. The 6.4 percent August inflation is a spike, and will go away. 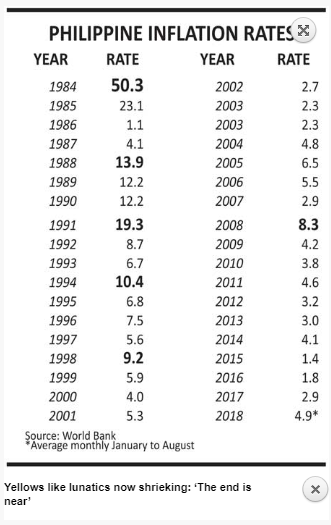 More importantly, the country has been through worse bouts of inflation in the past 40 years, and our institutions, mainly the Bangko Sentral ng Pilipinas, whose main job precisely involves this, have learned to contain inflation, quickly and easily. In 2008, the worst global recession after the 1929 Great Depression hit the planet, translating into a 12.4 percent inflation rate in September that year. By the end of the year though, this was contained — to the credit of President Gloria Arroyo’s P330-billion Economic Resiliency Plan —so that the whole-year rate was at 8.3 percent, with the momentum price deflation continuing into the next three years. There were similar such spikes in 2001, 1994, 1998, and 1971 — the latter even a perfect storm of sorts as there was both an economic crisis (triggered by OPEC’s oil embargo) and a political crisis (Plaza Miranda bombing, a violent national election, mass unrest. Would you believe, the inflation rate in 1971 was 21 percent and in 1974, 41 percent, yet Marcos continued to consolidate his one-man rule throughout that decade? The worst surge of inflation was in 1984 when it hit 63 percent in September that year. This was another politico-economic storm. The worldwide debt crisis broke out in 1981, we defaulted on our loans in 1983 that imports nearly ground to a halt, and then there was political volatility after Ninoy Aquino’s assassination in 1983. Guys, we’re not Venezuela, which is situated in a continent that for some reason has been so prone to hyper-inflation since before World War 2. The 1983 and 2008 global debt crises have so strengthened our financial and monetary system that this very easily responds to moves to contain inflation. 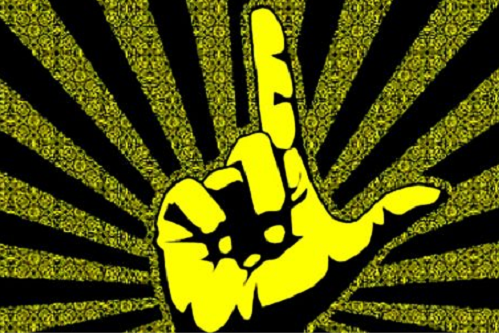 It’s a characteristic mark of the Yellows to have very limited phraseology (or erudition) that they use only tired clichés as this recent “The end is near,” “Never Again” (the Jewish cry against the Holocaust), and of course “Daang Matuwid“(“Straight Path,” a reference to Islam). In her exertions to claim that the military will go to the aid of Trillanes, a Rappler writer who’s in a time warp in the 1980s, thinking that she is still covering Gringo Honasan and his dashing comrades in the Cory regime (and not the megalomaniacTrillanes) titled her piece, “Don’t mess with the military.” She’s forgotten that that cliché had evolved into a comedic line, after the box-office comedy movie, “Don’t Mess with the Zohar,” where Adam Sandler played the hilarious anti-hero. So appropriate to use that line. Trillanes is more hilarious now than Sandler."